If you look at all of the countries in which Russia has an influence you will notice that each nation has been compromised in a very similar fashion...from within to the top. In Ukraine, it was Yanukovich, who governed Ukraine according to Putin's agenda. And presently in most European democracies you'll find many Ministers who look favorably at Putin and do his bidding in the halls of their country's Parliaments. And now there is a lobbyist in the White House shilling for the State of Russia and his manners are the same as Putin. Notice how anyone who says anything against Trump may suddenly be under the threat of physical violence directed at them. e.g. The female questioner at Trump's N.H. campaign appearance last year and the Carrier union rep.. They each have received death threats for something as innocent as a comment. Just take a look at how opposition forces in Russian controlled territories are dealt with. In Crimea they are threatened, imprisoned, kidnapped, or killed. The same history has always been in Russia where assassinations have become a viable campaign tactic against political opponents (Boris Nemtsov). Could the unimaginable continue here? Will mysterious deaths suddenly start solving many disputes here too? Putin's power is already controlling the agenda in the Middle East and Europe is an anxious step away from lifting sanctions. Putin is now perhaps the most powerful man in the world as he expands his influence through fear and violence. 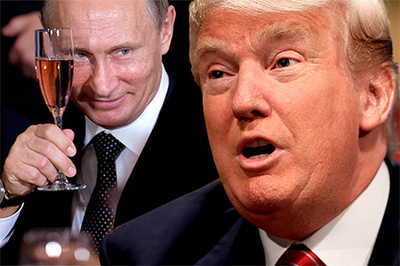 Trump's people still don't really know Putin and what he is capable of doing, and most of all they can't see their role in helping all that has and is happening.....Dig deep enough and you'll be surprised at what you'll find. But really, Putin now has a foot in the door of the White House.....what now? 1. By the end of the first year the GOP will ask Trump to resign. He refuses. 2. By the end of the second year, Trump will resign. 3. In the third year, under Pence, civil unrest will escalate....neighbors against neighbors. 4. In the fourth year, a nation-wide civil unrest will turn into a "modern-type" coup....a government reset. As for the world, that depends on the new axis powers: Russia, China, Iran...and what the free world allows them to do. In their own fashion they are each already acquiring territories. Intriguing historical scenario indeed, Bohdan. But there are others possible derived from ancient history. How does the saying go: birds of a feather flock together. Bullies attract other bullies, be it in elementary school back yards, or the global political stage. Let me to offer one such scenario from ancient Roman history portending to the future. There was a famous, or better an infamous, Roman emperor by the name of Caligula whose reign lasted some five years. He had a rather spiteful, vengeful, narcissistic, extremely authoritarian psychopathic paranoid streak, showing no respect for the republican democratic institutions of Rome such as the Senate. He proclaimed his horse a Roman senator as an insult to Senators and proclaimed the institution as a whole incompetent, not appreciative enough of his shining brilliance and infallability. In our era he would be tweeting away and issuing 350 characters decrees and political positions. This again may begin to sound rather familiar, and indeed it is. Most ominously, Caligula in his sheer derangement, began showing contempt and disrespect for the very people in charge of his personal security, sworn to protect him: the Praetorian guards. He would force them to kneel before him not as an emperor but as a sacred immortal god. Slowly it dawned on the guards that they were dealing with an unhinged psychopathic madman who would stop at nothing to exact personal revenge for any perceived slight. Definitely a political risk for the whole empire, not to mention the Praetorian guards themselves. We know how the story ends. Caligula, in the end, Caligula is assassinated by the very people in charge of his security who of course justified the deed as a protective move to save the empire. Now, one can go into all kinds of geo-political, even ethical considerations on this historical event, but the more pragmatic down to earth moral of the story is that it is not very smart to alienate the very people who are sworn to protect you by calling them incompetent. They may arrange things so that their incompetence is fully proven and you, the immortal all powerful god, find yourself dead. At this point, we can safely let the readers envision other upcoming future scenarios. The Chinese have a curse that goes like this: “may you live in interesting times.” No doubt about it, we live in very interesting times and we haven't seen half of it yet.